how much do tandem bikes usually sell for? im looking to by one for under a hundred dollars. i also was hoping to get one from someone close by so i didnt have to pay shipping. southern ontario, or michigan. ps. im new to this, that meant to say WANTED. and i dont mind having to restore the bike. new, old, i dont care. I have a Schwinn bike with the serial number ED85234 and I am wondering how old it is, value, any other info about this model and if anyone is interested in purchasing it. All info is appreciated. Thank you. The price guide here has tandems. If you look at the options under the 'model' query you will see tandems. The serial number will only tell you the year. There's a serial number chart in the "General Resources" section of this site. There's also plenty of information on the Schwinn Twinns in the archives here. 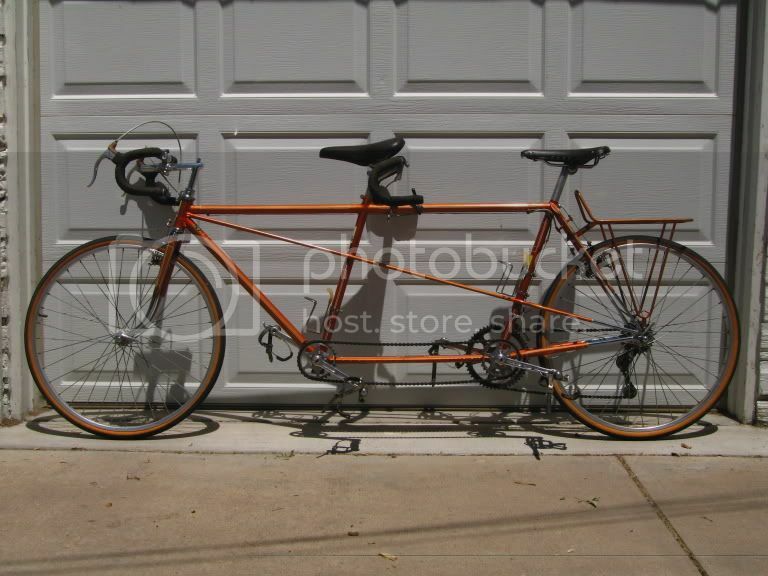 i really want a tandem bike. how much did you want to sell it for? i own a schwinn twinn.is there any way i can find out how old it is just by looking at it?are there numbers on it some where that can tell me the age? Great condition and ready to ride with Campy Record! Metallic orange paint job, low miles, and one of a kind. Please call Bob at 303-798-4319. I just purchased an old ladies 26" bicycle produced for RH Macy & Company, Model Cyclone 80 Special. I would like to know approximately when this bike was made. I would also like to know the original colours - I think the frame is navy blue with red trim. Also looking for 26 x 2.125 replacement tires. Hi, I believe your bike was made fro Macy's by Columbia. what years and when yours was made should be easier to figure out by looking at it and comparing it to known Columbia bikes,catalogs, and columbia serial numbers.